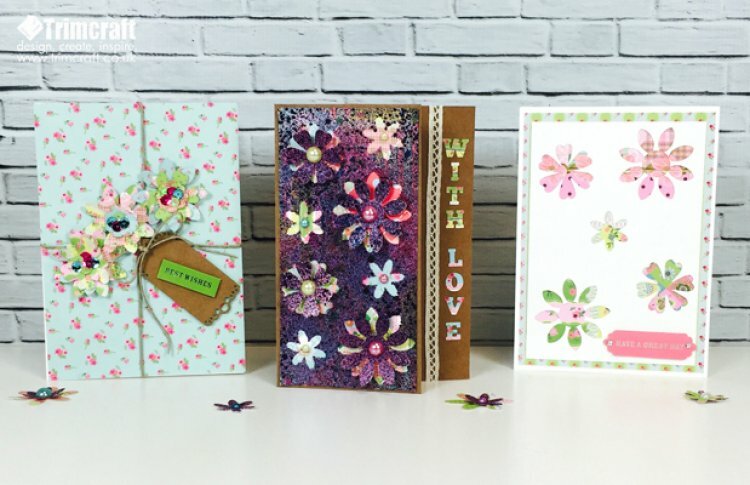 We have featured three cardmaking tutorials using the new Dovecraft Serendipity collection but these craft ideas will also work well with your left over paper scraps! 1. Trim a piece of white card to 11cm x 16cm, arrange the dies on the card randomly and cut them out to leave a window. You will have to put the card through twice if you are using the same dies. Tip: save your cut outs for the stencilled card project. 2. Using the Serendipity paper pad choose a multi patterned paper and trim to 10.5cm x 15.5cm, stick the die cut flower card on top. 3. Cut a piece of the striped floral paper to 12cm x 17cm and stick to your card blank, stick the die cut flower rectangle on top. 4. Finish with a sentiment topper in the bottom right hand corner. 1. Take a white 5”x 7” card blank and measure 9cms down the spine, punch a small hole just big enough to pass twine through. 2. Cover the front of the card blank with the Dovecraft Serendipity blue floral paper cut to 12.5 cm x 18cm. 3. Thread some jute twine through the hole you made and then wrap the twine around the front of the card like you were wrapping a present. Die cut a tag from kraft card and attach to the twine before finishing with a bow. Stick the tag onto the card using foam squares, add a trimmed down sentiment topper on top at an angle. 4. Die cut 9 to 12 flowers in various sizes, layer 3 or 4 blossoms to create three flowers. Glue the flowers onto the card around the top of the bow. Tip: Place a die cut blossom into your cupped palm and gently press the flower to create dimension. 5. Add a cluster of sequins into the centre of each flower for a bit of sparkle. 1. Trim 3.5cm from the front length of your 5” x 7” kraft card to create a stepped front. 3. Spritz over the flowers with the DecoArt Acrylic Misters and allow to dry. Tip: We lightly taped our flowers to our paper using washi tape on the underside, to stop them moving. 4. Remove the spritzed flowers from the paper. With foam squares, add the four larger flowers to the top of their matching stencilled shape, gently bend the petals up. To decorate, add pearls to the centre of each flower. 5. Add a strip of lace ribbon to the exposed back panel of your card, die cut the words ‘With Love’ and stick next to the lace ribbon to finish. These are just 3 ways to use the flower dies, how would you use them on your craft projects? We love to see your creations so don’t forget to upload and share your die cut creations in the project gallery.